Sea Dreams Soother Crib Toy is rated 4.5 out of 5 by 22. Dimension (in) 10" x 4.5" x 14"
Rated 2 out of 5 by Broeske12 from Strap attachment not long enough So I bought this product thinking it would be great to help my baby sleep. And I threw the box and packaging away before I realized I couldn’t attach it to my baby’s crib. We have a newer style crib and the strap is about an inch shorter than I would need. So this is now junk. Also, I wish it stayed on all night. Rated 1 out of 5 by Asg2118 from Poor functioning item Purchased 2 within one month. The first one completely stopped working, exchanged it for a new one which has now started to make a terrible noise when the creatures move. Very disappointed, stuck with an item I can’t use because is got rid of the box thinking the second one would be good! I Do not recommend purchasing this sea dreamer. Rated 5 out of 5 by Grantleys Music Box from 4 years and still changing batteries We bought ours when our son was a baby and in Children's Hospital with Neuroblastoma. He's now 4 years old and in remission and still watches it every night. It really needs a lithium battery and charger. We've gone through a ton of C batteries. It is getting noisy in it's old age, but we have no other complaints. We spent several long nights half-sleeping to its song during that journey and we'll never forget it. It soothed him when we couldn't hold him. Thank you. Rated 1 out of 5 by Grandpa Dave from Stopped working after a month Baby loves it but it is defective and stopped after a month. Don't have box or receipt so we are stuck with a non working baby toy. Rated 5 out of 5 by Crystalb2286 from Amazing soother with awesome remote control featur This soother is such a great asset to an nursery, I love the fact that I can use this as both a sound machine & light or just as a sound machine. I also am a big fan of the remote control so I can turn it back on without going all the way into my infants room. I was at first unsure how to hook this to the crib when it arrived out of the box the remote control looked like it was in a holder and I didn’t realize that was another part of the soother to hook onto the crib. I love that this can attach to the crib easily (now that I figured that part out!) as well as sit on the dresser or night stand once my infant is a toddler! Rated 5 out of 5 by Crystalb2286 from Amazing soother with awesome remote control featur This soother is such a great asset to an nursery, I love the fact that I can use this as both a sound machine & light or just as a sound machine. I also am a big fan of the remote control so I can turn it back on without going all the way into my infants room. I was at first unsure how to hook this to the crib when it arrived out of the box the remote control looked like it was in a holder and I didn't realize that was another part of the soother to hook onto the crib. I love that this can attach to the crib easily (now that I figured that part out!) as well as sit on the dresser or night stand once my infant is a toddler! 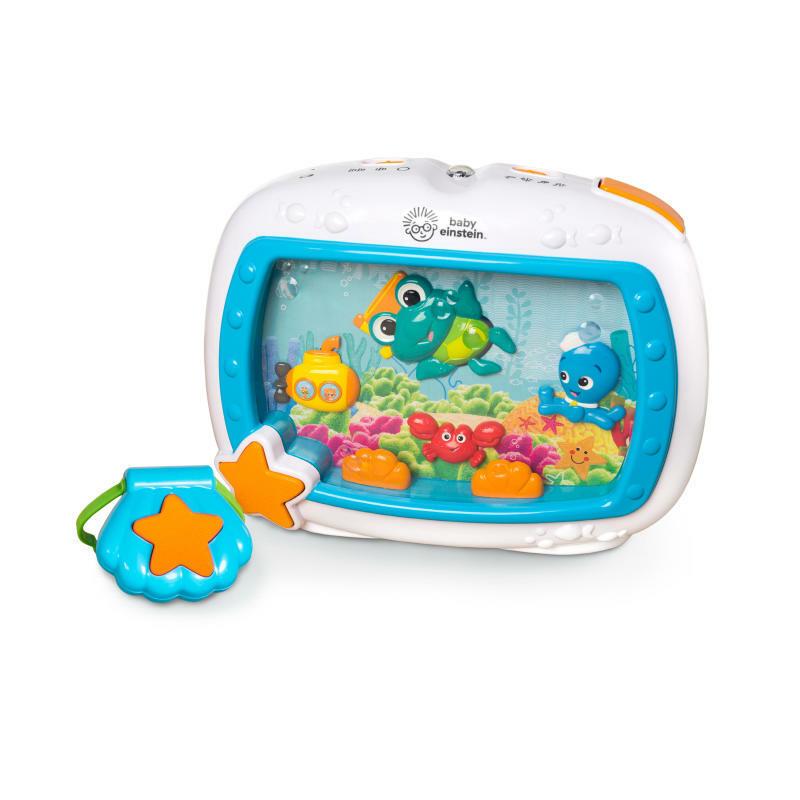 Rated 5 out of 5 by Megsters from Great toy I have a 3 moth old that is attracted to the 'movement' of the fishtank and lights. I would also turn on the music for her to fall asleep. I found myself leaving the music on after she fell asleep. This toy seems well thought out and the well constructed.